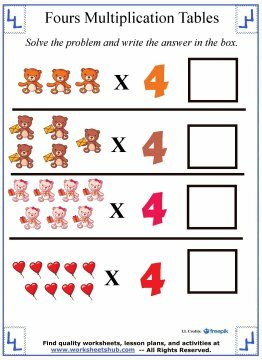 Be sure to download your free Multiplication Table Chart here before you start the lesson. have already been presented when learning the multiplication tables for twos and threes, and when learning how to multiply by one. 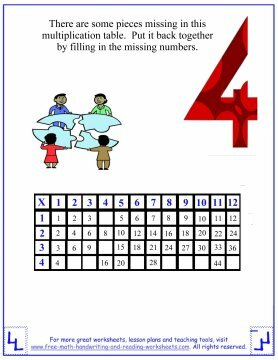 Before working on this multiplication table, you might find that it will help your child to review skip counting by fours. Having a solid grasp on that lesson will make learning these multiplication tables much easier. Downloading the practice worksheets below will give additional practice in writing and thinking in multiples of 4. Click on the pictures below to open a PDF file in another window where you can download or print it. There are directions on each worksheet, but I'll give a quick overview of each one below. 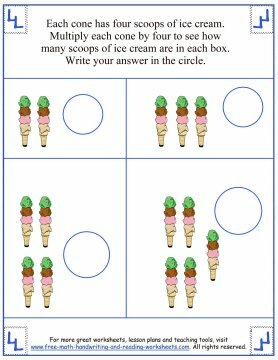 In the first paper there are four boxes with ice cream cones in them. Each cone has 4 scoops of ice cream on it. Count how many cones there are and multiply by the number of scoops to get the correct answer. The next activity is a simple maze. 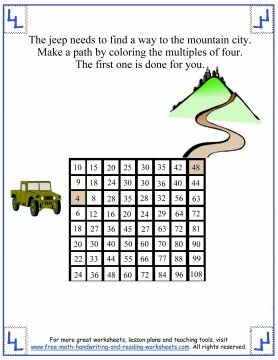 Start with the jeep at block four and count by multiples of four to work your way through the multiplication table chart. 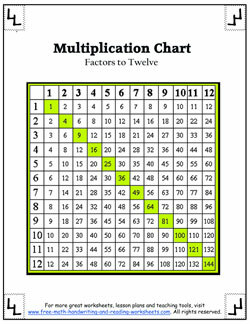 The third handout is a multiplication chart that is missing some numbers (all of which are multiples of four). 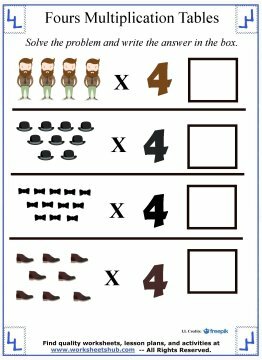 Have your child fill in the correct numbers for each empty box. The next one shows four rows of four-leaf clovers. 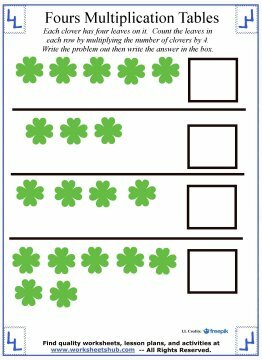 For each row count the number of clovers and multiply it by four (the number of leaves) to determine how many leaves are in each row. Write out the multiplication problem on the space provided then write the product in the box. The next two sheets are similar. In each row there are a certain number of items. Count the items, then multiply them by four. Write the correct answer in the box. You may also have your child write the problem out in the space provided. For more help with multiplication and the times table, see the pages below.